It’s February 15th! I hope you’ve published your story and come to link up! Your assignment was to write a complete story in 500 words or less using the scenario below to kick-start your thinking. February is the month of love. Your prompt required only that you write a love story. Fashion it as you will, and remember there are many kinds of love. Valentine’s Day. Jared stared at the date on the calendar. Two years ago Anna broke up with him on Valentine’s Day. Last year Steph broke up with him on Valentine’s Day. Both of them rejected him and his gifts because he hadn’t brought them diamonds or roses. “Not good enough,” they’d said. Jared knew they were right, they weren’t good enough. He was looking for a girl who wouldn’t judge his value by the price tag on the gifts he offered. He pulled his 1977 Orange Capri up in front of Janie’s house and grabbed the fern and daisy bouquet he’d placed on the passenger seat. He’d gone to his grandmother‘s greenhouse and picked the flowers himself, then he wrapped them in white wrapping tissue covered in red polka dot hearts. He’d secured the bouquet with a bit of red velvet cord and it looked every bit as glamorous as any professional presentation would have. Jared carried the flowers to Janie’s door and rang the bell. He was wearing blue jeans, a blue and white stripped, long-sleeved shirt and a dark blue v-neck sweater. Janie came to the door in a simple pink shift. It had a rounded neck line, flutter sleeves and cute little flirty pleats in the skirt. She looked as fresh as the wild flowers. Jared smiled, told her she looked lovely, and offered her the flowers. She accepted them exclaiming over the wrapping paper. “How beautiful! I almost hate to take them out of the tissue.” Even so, Janie took the flowers to the kitchen and arranged them in a simple glass vase which she then carried into the living room and placed on the coffee table. “It’s perfect,” Jared said. “You’re perfect. This car tells me I’ve found the girl of my dreams.” He’d finally found a girl he was willing to buy diamonds and roses because he knew she valued thoughtfulness and time more. Sorry this is up late! It was supposed to go live at midnight last night, but there must have been a glitch. Here it is now! Lovely story! Glad Jared found one who was just right. I came up totally blank this time — I dabbled with a couple of ideas that just didn’t seem to go anywhere.You’d think with Valentine’s Day I’d have had plenty of inspiration. Wonderful Quilly, Yours is superb yet again. It is so nice to read a story where nice guys and gals finish FIRST and TOGETHER. Well done! Just don’t make us read an O. Henry version of their sacrificial love come December. He just HAS to keep that 77 Capri! My little brother had many of those matchbox cars and I’d almost bet he had one of those. Janie is a girl after my own heart – looking the little things that say I love you! I love it, Quilly! I laughed and laughed as it touched a tickle bone. For even some personal reasons; memories came to mind when I read ” his 1977 Orange Capri !” I’ll tell you but it gets long. When Mrs. Jim and I met I had a recent model T-Bird. Her boy friend at the time had a fairly recent Mercedes. And one of her previous boy friends had a 1965 Corvette (his dad owned a dealership). I think she liked boy friends with nice cars. Mrs. Jim owned a 1968 Chevy Chevelle Maliibu with 107K miles on it. I did car work on Fords but never on Chevys. I worked for Ford Aerospace at the time. When the cars leased to employee (I was not elibible to lease one) came up for sale I bought her a one-year-old low mileage Ford Pinto. She drove it or the T-Bird all over the place and we kept it until it went under water in a flood of 1979. She never lets me forget that I sold her lovely Chevellle and got her a 1972 Pinto. 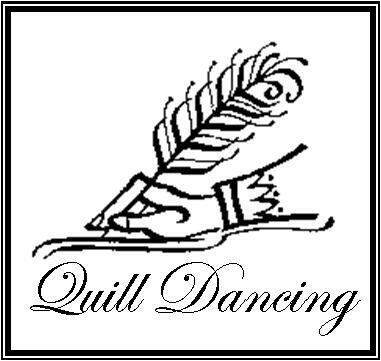 Thank you for the Quill Dancing excercise. I would have liked to have accepted your writing invitation but things were too hectic for me. But now today I am slowing down as we are visiting and baby sitting our grandkids in London. March??? What a sweet story, it put a big smile on my face.